If you are getting divorced in Bangkok then speak to our lawyers at the Head Office in Bangkok Thailand. speak to us online or best yet walk into our office in Bangkok to speak to a divorce lawyer today. With years of experience in divorces with expats and foreigners we are best able to offer you a cost effective solution to your legal problems. Speak to us online now or allow us to ring you back if you are in the US. We are always available to assist you in your divorce. 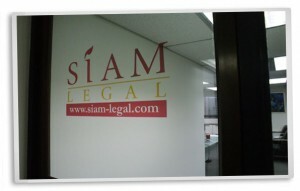 We did not become Thailand largest legal services network for nothing!